Nigel Farage is back as UKIP's leader after Diane James unexpectedly quit the job after 18 days at the helm. Speaking to the BBC, Mr Farage said he would be the UK Independence Party's interim leader until a fresh election was held to find Ms James' successor. "I keep trying to escape... and before I'm finally free they drag me back," he joked. Ms James announced her resignation late on Tuesday, citing professional and personal reasons for her decision. Ms James, who succeeded Nigel Farage on 16 September after he resigned following the Brexit vote, said she did not have enough authority in the party and would not be "formalising" her nomination. She had not appointed a deputy and UKIP officials were initially unable to say who was now the leader of the party. But Mr Farage, who was UKIP leader from 2006-2009 and 2010-2016, told the BBC that he was technically leader, telling the Victoria Derbyshire programme: "I will continue as the interim leader of UKIP and we will go through the electoral process." Asked why Ms James had stood down, Mr Farage said he believed it was partly due to a family illness and the "realisation" of what the job entailed. "When you take this job your life finishes. This is what you are 24/7, there is nothing else. I think she looked down the barrel of that and thought 'this is not how I want to live my life'." 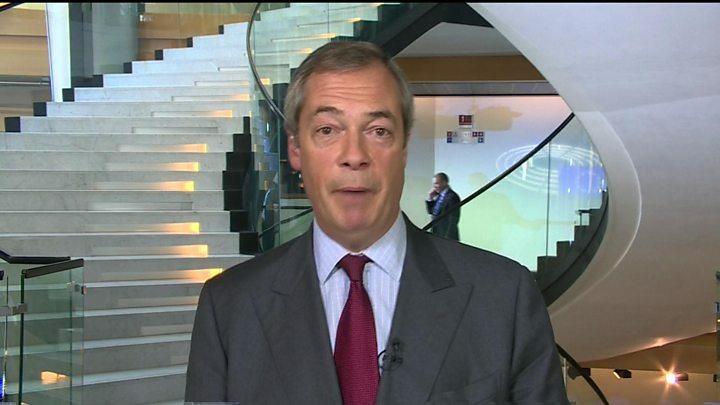 Mr Farage said he was "sorry" for Ms James as "it's a very difficult thing to have done". While it was "not a great day" for the party it was "not the end of the world", he said. 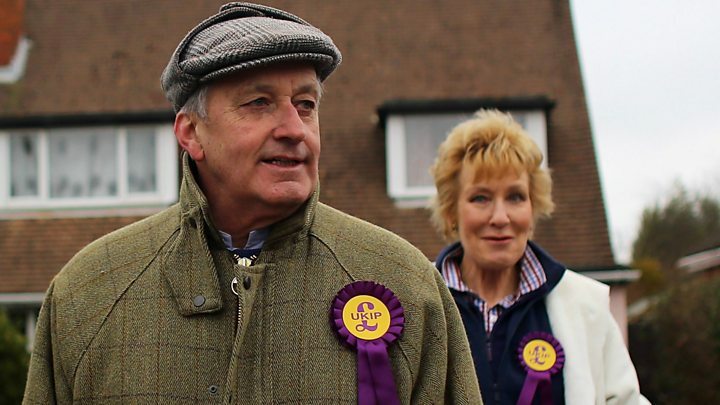 Asked about speculation that Welsh UKIP leader Neil Hamilton could be installed as interim leader by the party's national executive committee, Mr Farage said: "Really? Well we'll have to see about that won't we. "I do not see any prospect of that horror story coming to pass," he said, adding that Mr Hamilton "doesn't do our public image a whole host of good". But speaking to the BBC's Daily Politics programme Mr Hamilton said he had no interest in being the UKIP leader in any circumstances. He also disputed the idea that Mr Farage was interim leader, saying it was for UKIP's ruling body to appoint an interim leader and that he would like MEP Paul Nuttall to take on that role. 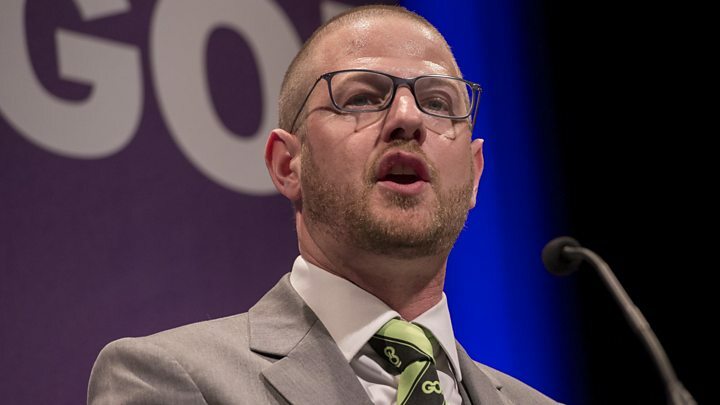 UKIP chairman Paul Oakden told BBC Radio 4's Today he would look to hold an emergency meeting of the party's NEC to confirm the process for electing Ms James's replacement. "Whilst the decision is unfortunate, it is one that Diane is entitled to make. We thank her for all her work as leader, and as a hard-working MEP, a role she will continue with her customary vigour." Media captionUKIP chairman Paul Oakden on the resignation after 18 days of UKIP leader Diane James. The Electoral Commission said UKIP submitted the paperwork notifying it of the change in leadership on Monday, although it had not been processed as officials had questions regarding the completion of the form. "We are aware that the newly elected leader of UKIP has now stood down and are in touch with the party to confirm how they wish to proceed regarding updating their entry on the statutory register," a spokesman said. Ms James said in her resignation statement sent to The Times newspaper: "It has become clear that I do not have sufficient authority, nor the full support of all my MEP colleagues and party officers to implement changes I believe necessary and upon which I based my campaign. "For personal and professional reasons therefore, I will not take the election process further." The former Conservative councillor, who defected to UKIP in 2011, said she would "continue to concentrate fully" on her activities and responsibilities as an MEP, adding it was her "final media statement on the issue". Even before Diane James' shock resignation, UKIP was a party teetering on the cusp of chaos, riven by feuds and factionalism. Nigel Farage's decision to quit in the summer stripped UKIP of his dominant, driving personality, which held a quarrelling party together and gave it a sense of identity and momentum. The subsequent brutal leadership contest exposed the personal and political fault lines with the party descending into near civil war. On top of that, victory in the Brexit referendum had appeared to deprive the party of its very reason for existing. Inevitably there will be speculation about a possible permanent return for Mr Farage, although he has insisted he will not do so. Now with a slow haemorrhage of support returning to the Tories, there will be questions as to whether UKIP faces the fate of so many minor parties squeezed to the margins of British politics. Ms James, a former businesswoman and healthcare professional, defeated four other contenders - Lisa Duffy, Bill Etheridge, Liz Jones and Phillip Broughton - in the leadership battle. She won 8,451 votes out of the 17,970 votes cast, ahead of Ms Duffy, who received 4,591. One-time frontrunner Steven Woolfe was barred from standing after submitting his nomination papers too late, while Suzanne Evans was unable to take part as she was suspended at the time. Ms Duffy told the BBC she had not yet spoken to Ms Evans about the leadership, but that they would have a conversation over the next two days to decide whether either of them would stand and whether they would back each other or stand against each other. She told Radio 4's Today she was "not overly surprised" at Ms James' resignation as she did not believe she wanted to do the job and claimed she had shown no leadership since her election. But she said she was "disappointed" for party members. Meanwhile, former contender Ms Jones said she was considering throwing her hat in to the ring again. 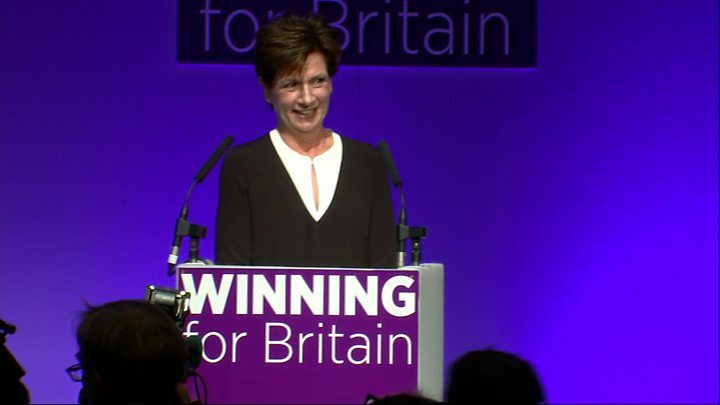 Media captionDiane James addresses the UKIP party conference after being elected its new leader. Ms James, in her acceptance speech at the party's conference in Bournemouth, had said UKIP would "confound our critics", "outwit our opponents" and "build on our election success" and more. But the race to replace Mr Farage had exposed bitter divisions within UKIP, with Ms James encountering criticism from some in the party after declining to take part in hustings debates around the country with her rivals. Responding to Ms James's resignation, UKIP's only MP, Douglas Carswell, said: "I'm sad and surprised. I just hope she's alright". Meanwhile, a number of senior UKIP members in the East of England have told the BBC of having "nagging concerns" about the "radio silence" from Ms James's camp since her election as leader.